Your Xbox 360 is capable of playing back your music and videos and viewing your digital photos. With Connect360, your Mac's ready to share. 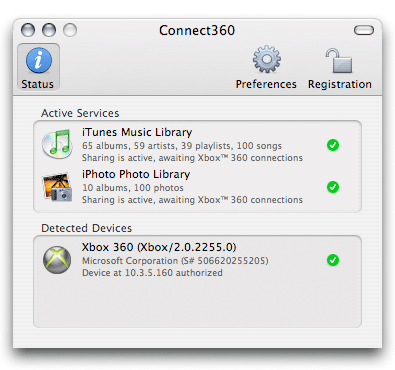 Connect360 automatically indexes your iTunes and iPhoto libraries and shares them to your Xbox 360. You can then use the Xbox 360 Dashboard to browse and play your media, organized in the exact same way that it is on your Mac. Connect360 now supports WMV+WMA, H.264 and MPEG4 video sharing, allowing you to stream HD quality video right to your living room!